Seattle pedestrian hit by car jaywalking, can they recover damages? Who is at fault in a situations where someone is hit while they are walking across an area of a street that does not have a cross walk or and is not an unmarked crosswalk? There are plenty of areas in Seattle where pedestrians decide to cross the street between cross walks, whether it is to cross to their car, get to a movie theatre, get to a sho, etc. If someone is hit as a pedestrian by a car at a non crosswalk area, they can still recover damages from the driver of the other car. Washington State is a comparative fault state so the jury would weigh what percentage of fault each person had for the pedestrian being hit. The pedestrian could be at fault for jumping in front of the car and the car could be at fault for speeding or not paying attention to the road ahead of them. 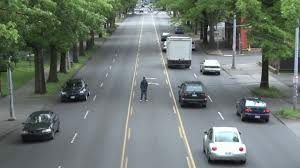 Additionally, the pedestrian would then recover for the personal injury damages they suffered due to the car accident, offset by the percentage they were at fault and the damages they caused to the driver of the car. In Seattle, pedestrians are required by law to cross the street in a cross walk or at an unmarked cross walk. They are generally not allowed to cross the street in between blocks. This is for the safety of pedestrians and drivers because cars are more likely to see pedestrians at cross walks and at the end of a block. In addition to being required to cross the street at crosswalks, pedestrians are also not allowed to jump out into the street. They are to wait at the cross walk until a car stops for them before entering the street. This again is for the safety of pedestrians and cars to prevent car accidents. While the pedestrian has the right of way and cars are to yield the right of way to pedestrians, pedestrians cannot jump blindly out into the street and possibly cause a car accident by being hit by the car or causing the car to slam on their brakes and then be rear ended in another car accident. RCW 46.61.240 Crossing at other than crosswalks. Right of way at uncontrolled T-Intersection turning right? If two cars reach an intersection at the same time but the car on the right wants to turn right, who has the right of way? Who would be at fault if there was a car accident in this scenario? There is no law about “T-intersections” in Washington State. Therefore, in order to determine who has the right of way, we must look at other laws. 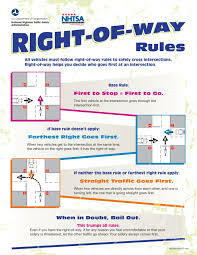 The right of way law at an uncontrolled intersection is governed by RCW 46.61.185. It states that the car on the right is the favored driver if both cars enter an intersection at approximately the same time. This means that the car on the right at an uncontrolled T-intersection would have the right of way. This assumes that there are no stop signs or yield signs governing the intersection, which there most likely would be. If the car accident happened at a “T-Intersection” in a parking lot, Washington state law in general would apply and the car on the right would have the right of way, assuming they reached the intersection at the same time. The right of way is not absolute, however, and there are some exceptions. The exceptions include to act reasonably under the circumstances. If you clearly see that the car on the left is not going to stop, you have an obligation to act reasonably and avoid the car accident. You cannot blindly continue straight if you can avoid a car accident. You may be at fault even though you were the favored driver in under the circumstances. This is detailed in the Washington Pattern Jury Instruction 70.02. The favored driver is entitled to rely on the disfavored driver’s yielding the right of way at an uncontrolled intersection until the favored driver reaches that point at which a reasonable person exercising reasonable care would realize that the disfavored driver is not going to yield. Whitchurch v. McBride, 63 Wn.App. 272, 818 P.2d 622 (1991); Maxwell v. Piper, 92 Wn.App. 471, 963 P.2d 941 (1998). SMC 11.55.010 – Right-of-way of vehicles approaching an intersection. Vehicle turning left.The driver of a vehicle intending to turn to the left within an intersection or into an alley, private road, or driveway shall yield the right-of-way to any vehicle approaching from the opposite direction which is within the intersection or so close thereto as to constitute an immediate hazard. Water causing a car accident – whose fault? This is the rainy season in Seattle and there is no shortage of water on the road. Seattle wet weather plus Seattle aggressive driving equals car accidents. It is a fact that people in Seattle drive way too fast in the rain. These people must not have been in a car accident yet because if they have been in one they would drive much slower in the rain. Whose fault is the car accident if you drive and slide out because of the rain? Sliding out or hydroplaning in the rain, is a term that describes cars losing traction with the ground. 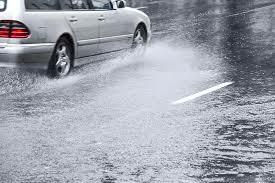 A car generally loses traction to the ground in wet weather where the car is driving too fast for conditions and there is too much water on the ground. Heavy rain qualifies as a potential hazard which requires you to drive slower than the speed limit. 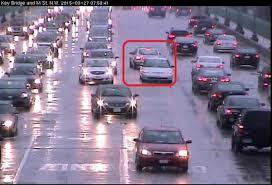 A reasonable and prudent person would drive slower if there is heavy rain and water standing on the road. Therefore, if you hydroplane into another car, you are at fault for the personal injuries that the other person may suffer because of you driving too fast for conditions. Your insurance will cover any injuries and damage that the other person suffered in the car accident. If you have been injured, please contact a Seattle personal injury lawyer immediately for a free consultation. Basic rule and maximum limits. The maximum speed limits set forth in this section may be altered as authorized in RCW 46.61.405, 46.61.410, and46.61.415. If there are no road lines painted on the road, is the state at fault for a car accident? With all the construction around Seattle it is not uncommon to see areas of road that are not painted in fully. I noticed one stretch of road recently going across I-90 to the mountains where the lanes do not have lines painted on the cement to divide the lanes of traffic. I-90 in the mountains is constantly getting new updates to the roads as a large lane expansion is happening. Someone must have forgot to paint the lines and they don’t have time to repaint them, which is not a good excuse because people’s lives are now at risk. Car accidents in and around Seattle can occur when two cars believe they have the right to a lane. Merging car accidents are some of the most common forms of car accident injury cases. Who is at fault in a merging car accident case is one of the most difficult things to determine if two cars merge into the same lane at the same time. If a lane of traffic is not painted, a car could reasonably swerve into another lane because they though it was their lane of traffic. Who is at fault in this scenario? 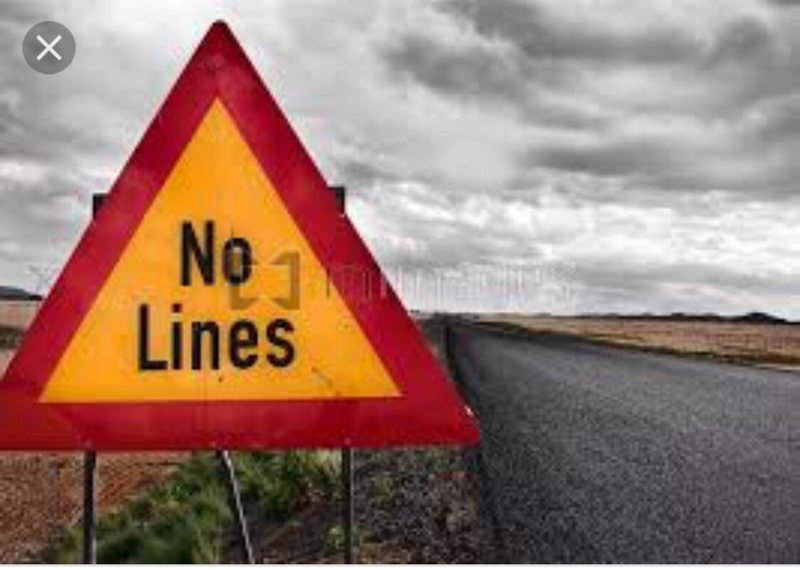 The state and construction company are at fault for any resulting injuries for a car accident caused by road repair gaffs like forgetting to paint lane lines. The same principal applies to any other road construction take like leaving equipment in the middle of the road, making the road have a divot, and anything else that creates a hazard for other drivers. If you have been injured in a Seattle car accident, you need a Seattle personal injury lawyer immediately. 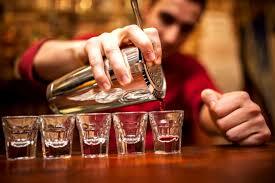 Consultations are free and we are paid out of the settlement so there are no out of pocket expenses. Everyone can afford a lawyer but you cannot afford not to have one against insurance companies. Who has the right of way at a two way intersection? I came across this very scenario the other day while driving but couldn’t figure it out so I let the other guy go first to avoid an accident. If you are approaching an intersection with a stop sign on your side and a stop sign on the other side but non in the center, who has the right of way if you and another car going the opposite way arrive at an intersection and you want to turn left and the want to go straight? Note that you both wait a second for traffic to clear before proceeding. At a four way stop if this had occurred, you would have the right of way because you were first in time. 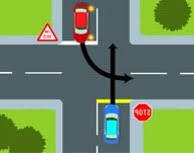 However, this is different as you are planning on turning left and they are going straight in a two way stop. In this situation, it would appear that you must give way to the person going straight across the intersection. If there was a collision with the vehicle going straight and you turning left in front of them, there is an argument that could be made that you were first in time so you have the right of way. However, they may be able to point to the law regarding vehicles turning left and giving the right of way to the vehicle coming straight from the opposite direction. In the alternative, if both vehicles were turning left and a collision occurred, you would have a great argument for being first in time and would in fact have the right of way in this instance. However, you would need an independent witness in order to verify your statement and prove that you were in the right. The driver of a vehicle intending to turn to the left within an intersection or into an alley, private road, or driveway shall yield the right-of-way to any vehicle approaching from the opposite direction which is within the intersection or so close thereto as to constitute an immediate hazard. If you have been injured in a car accident, you should contact a Seattle personal injury lawyer in order to preserve your rights and learn about your potential rights moving forward. Consultations are free and Seattle personal injury lawyers are paid out of the settlement so there is no high hourly fee. Everyone can afford a Seattle personal injury lawyer but you cannot afford not to have one against the insurance companies. What is lane sweeping and is it illegal? Lane sweeping is not what you think – a person with a broom sweeping a lane. 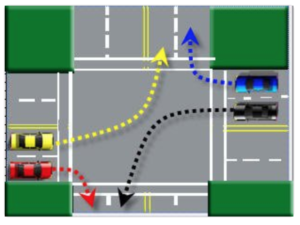 Lane sweeping is avoiding a lane of traffic in order to get into another on a turn. However, some studies have shown that 50% of drivers commit lane sweeping turns. Lane sweeping is extremely dangerous and can cause severe car accidents and injuries. If you are turning right or left, you must turn into the lane closest to you. You may not turn into the next lane over just because that is the more ideal lane that you want to be in. You must first enter the lane closest to you and then signal and change into that lane 100 feet later and not immediately. If someone hits you because they are lane sweeping, they are at fault. You have the right to the closest lane to you and they have the right to the lane closest to them. It can be difficult to maneuver if you are the one turning left and there are cars that could be going straight or turning. You should make sure you recognize the intention of the driver in front of you before proceeding into a left hand turn across oncoming traffic without a green arrow. If a car is going straight, they have the right of way in a non green arrow situation. (1) Right turns. Both the approach for a right turn and a right turn shall be made as close as practicable to the right-hand curb or edge of the roadway. (2) Left turns. The driver of a vehicle intending to turn left shall approach the turn in the extreme left-hand lane lawfully available to traffic moving in the direction of travel of the vehicle. Whenever practicable the left turn shall be made to the left of the center of the intersection and so as to leave the intersection or other location in the extreme left-hand lane lawfully available to traffic moving in the same direction as the vehicle on the roadway being entered. Dangers of the turn lane: First in time = right of way? Turn lanes are some of the most misunderstood traffic lanes. Not many people know how early is too early to get into a turn lane and who has the right of way to it. This is so misunderstood that many car accidents are caused because of the confusion on who has the right of way. Today we will focus on who has the right of way when you turn into the turn lane ahead of other traffic and another car in front of you wants to turn into the turn lane and crashes into you. Who is at fault for this situation? A number of driving rules come into play in this situation: When can you be in a turn lane? What can you use the turn lane for? Who has the right of way once you establish yourself in the lane? RCW 46.61.290(3)(c) Upon a roadway where a center lane has been provided by distinctive pavement markings for the use of vehicles turning left from either direction, no vehicles may turn left from any other lane. A vehicle shall not be driven in this center lane for the purpose of overtaking or passing another vehicle proceeding in the same direction. No vehicle may travel further than three hundred feet within the lane. A signal, either electric or manual, for indicating a left turn movement, shall be made at least one hundred feet before the actual left turn movement is made. RCW 46.61.305 (1) No person shall turn a vehicle or move right or left upon a roadway unless and until such movement can be made with reasonable safety nor without giving an appropriate signal in the manner hereinafter provided. (2) A signal of intention to turn or move right or left when required shall be given continuously during not less than the last one hundred feet traveled by the vehicle before turning. If you have established yourself in a turn lane by giving proper notice and are within 300 feet of your turn, you have the right to the turn lane as being first established in the lane even though a car in front of you wants to be in the lane as well. The earliest you can change lanes into a turn lane is 300 feet before your turn or the length of a football field. Additionally, just because a car is in front of you doesn’t mean they have the right of way into the turn lane. 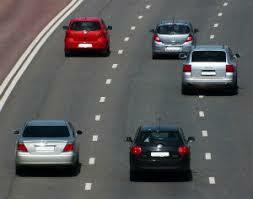 A car that has fully established itself in the lane legally has the right of way to that lane. A signal of lane change must be made at least 100 feet before the turn to give adequate notice to those around you. Speeding and illegal lane changes can come into play to say otherwise on this one. If you have been injured in a car accident, contact your Seattle personal injury lawyer today for a free consultation. We are paid out of the settlement making it so anyone can afford to hire us. Have you ever wondered if those stop signs in Westwood Village in West Seattle or the mall at Northgate or Bellevue are enforceable? What would happen if you drove right through one? Well, those stops signs within the mall grounds are not technically enforceable. That means that a police officer cannot stop you and give you a ticket for running a stop sign. What if you run a stop sign and cause a car accident in a mall or private parking lot? 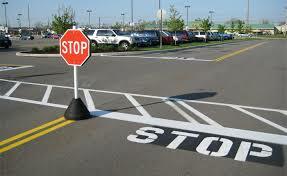 If you get into an accident by running a stop sign in a mall, it is grounds for liability. This means if you ran a stop sign in the mall, another person would reasonably believe that you were going to stop. If they had the right of way, you are at fault for running the stop sign. What if you are driving fast on the private parking lot? Police officers may stop and ticket a driver if there is suspicion of DUI, the vehicle is being driven recklessly, or other criminal acts are being committed law. Traffic tickets in general are not enforced but these acts are. What if you run the stop sign leaving the mall? While the stop sign may not be enforceable, RCW 46.61.365 states that you shall stop prior to driving onto the sidewalk area leaving the private road and yield the right of way to other vehicles. This would be a traffic offense at this point. Failure to Signal is Asking for a Car Accident? I have a pet peeve, people that don’t signal. It is so frustrating to be driving in my lane when all of a sudden someone changes into the lane in front of me without signaling or while sitting behind someone at a stop light, they decide they are turning while I want to go straight leaving me waiting for them to turn when I would have been in the other lane had I known they were going to turn. Failure to signal is a big danger to those around you and yourself. When someone fails to signal, they are basically saying F*** you to everyone around them and that you don’t matter. People who do not signal are endangering themselves and those around them by not allowing others to know what you are about to do. If you are going through an intersection and then all of a sudden slam on your brakes to make a turn without signaling, you are increasing the chances that someone behind you is going to slam into your back and cause a car accident. People are not mind readers. When someone doesn’t signal, those around them only can assume one thing: you are going to continue straight and within your lane. Any deviation from your lane without signaling is against the law and can make you at fault for a rear end car accident if someone hits you. Did you know that almost 10% of car accidents across the country are caused by failure to signal or lane changing accidents. The National Highway Traffic Safety Administration estimates that approximately 533,000, or 9% of all motor vehicle accidents, are lane changing and merging accidents. Additionally, 200 of these accidents result in fatalities. What’s the fine? $124 fine. (1) No person shall turn a vehicle or move right or left upon a roadway unless and until such movement can be made with reasonable safety nor without giving an appropriate signal in the manner hereinafter provided. (2) A signal of intention to turn or move right or left when required shall be given continuously during not less than the last one hundred feet traveled by the vehicle before turning. (3) No person shall stop or suddenly decrease the speed of a vehicle without first giving an appropriate signal in the manner provided herein to the driver of any vehicle immediately to the rear when there is opportunity to give such signal. (4) The signals provided for in RCW 46.61.310 subsection (2), shall not be flashed on one side only on a disabled vehicle, flashed as a courtesy or “do pass” signal to operators of other vehicles approaching from the rear, nor be flashed on one side only of a parked vehicle except as may be necessary for compliance with this section. If you have been injured in a Seattle car accident, give Andrew Cherin, attorney at law a call today for a free consultation. Seattle personal injury lawyers give free consultations. Seattle personal injury lawyers are paid out of the settlement so everyone can afford to hire one but you cannot afford not to.